Today we are sharing a super easy way to add a little more cuteness to your Thanksgiving tablescape. I am obsessed with anything and everything pumpkin at this time of year so naturally I had to bring more pumpkin ideas into the mix when planning out things for Thanksgiving this year. We are hosting at our house and it will be a smaller group than normal as everyone will be scattered around the country this year. My initial thought was that it wouldn’t seem as much like Thanksgiving without a large group of people, but I quickly threw that thought aside and decided to embrace the small group. It is still Thanksgiving with family and the smaller group means it is a manageable size that allows me to really personalize the holiday, make it cute, and make a lot of stuff from scratch. It is going to be so much fun! Sculpting tools – I picked up a pack of tools at Michaels that worked great, but you can easily use nails, pencils, etc. Step 1: First you need to form the pumpkins and add bulk so you do not have a super thick piece of clay. You need something that will bake evenly (and not burn). Yes the clay can burn. I found that out while completing another project right after these pumpkins. To add bulk use aluminum foil as a base. 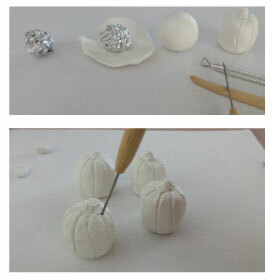 Make a ball of foil that is slightly smaller than you want your pumpkin to be. Step 2: Break off a piece of clay and really work with it, work it around in your hands to soften it and make it manageable. Divide it into enough pieces to make as many pumpkins as you want. I made 4. Make 4 balls then flatten them out. Now place a foil ball on top of each flattened piece. You will then wrap the foil evenly with the clay. Step 3: Now you will start to shape your pumpkins. This you will just have to play with a little. It will help some to have an actual pumpkin there to look at and copy. I did it by making sure it was not a perfect ball and gave it a more imperfect pumpkin shape. I flattened the bottom a little so they stand up. Next I made an indentation in the top. This is where I would later attach the stem. Then I made the lines to create the ribs in the pumpkin. I did this using a wooden tool to remove clay then smoothed the edges with my fingers. Once that was finished I added the stem. Lastly I took a tool (you could use a thin nail) and poked a hole in the back of each pumpkin. This is where the holder for the place cards will go. Step 4: Once you are satisfied with your sculpting it is time to bake. Bake according to the instructions on the clay you purchase. Mine was based off the thickness of the clay, which is why I used the foil to add bulk so the clay was not too thick. Once it is baked make sure to let them cool completely before moving onto the next step. Step 5: Now it is time to paint the pumpkins. I did this in 4 steps. (1) I painted the body of the pumpkin a solid orange color; this took 2 coats till I was happy with the coverage. 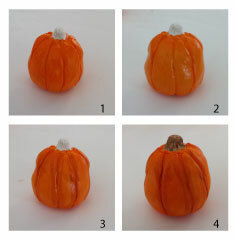 (2) Next I added highlights to the middle of each section of the pumpkin by adding a lighter yellow-orange paint color. (3) Then I added a darker orange. I just added a little brown to my original orange color. This adds shadows to the ribs of the pumpkin. (4) Lastly I painted the stems brown. Step 6: Once the paint is completely dry you can seal them with a clear glaze. I used Sculpey brand Satin glaze for this. Step 7: Lastly you will add the holders for the place cards. I used paperclips that I spray-painted gold. This can also be done with gold paperclips or bent wire. Use whatever you have on hand. The last thing to do is insert your place cards. 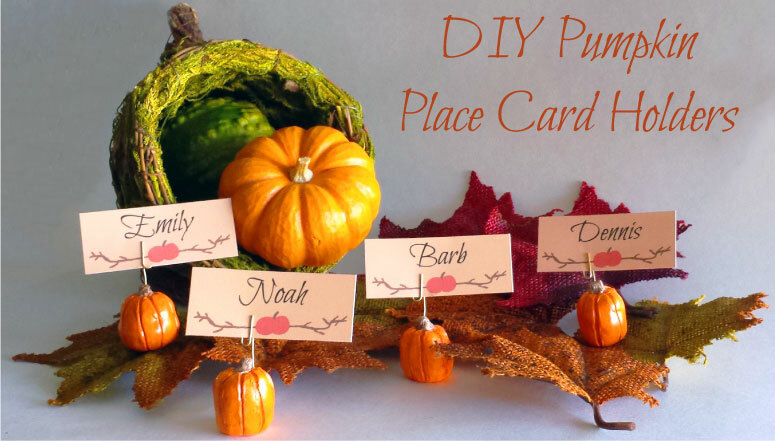 I have included a free printable of the place cards I used here (FINDS – Thanksgiving Placecard Printable). You can download and print this then add the names in your own beautiful handwriting or calligraphy.